Here participants will have the chance to take part in a series of workshops and learn about traditional culture from artists and performers including weavers, traditional healers and contemporary dancers. They will also view a short documentary about an extraordinary journey where two young Australian men from a remote Indigenous community in the Northern Territory travel to the Amazon rainforest to exchange stories and learn from each other. Participants will learn to become change-makers, benefiting from the knowledge and expertise of leaders such as April Long, Frank Brennan SJ and many more. They will return to their respective communities will the tools and skills for influencing change in different spheres, including media, online, politics and their local community. Did you know? More than 370 million Indigenous Peoples live in some 90 countries around the world today. They are: custodians of some of the world’s most biologically diverse territories, responsible for much of the world’s cultural and linguistic diversity and their traditional knowledge is an invaluable resource in many sectors, such as medicine and agriculture. At the same time they remain among the most marginalised and disadvantaged peoples in the world. “The workshops will engage participants in Indigenous art, spirituality, craft and language that demonstrate the extraordinary role Indigenous Peoples play now and in the past,” Walk As One campaign coordinator, Alex Engel, said. 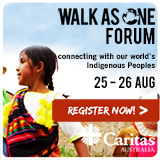 Caritas Australia has programs in more than 30 countries, walking alongside the poorest of the poor, many of them Indigenous. This entry was posted in Press Releases, Videos on August 7, 2012 by Mark Wei.